TaylorMade RocketBallz Driver - To Bond or Not To Bond? If you are like me, you might have been curious when you found out TaylorMade Golf was adding an additional model to the highlly succesfful RocketBallz driver line. The most recent offering is referred to as the RocketBallz "Bonded" Driver, and if you’re asking yourself why the “bonded” name, you’re not alone. Basically, the new RBZ Driver is a fixed hosel version of the original RBZ Driver. Therefore, the club head is actually “bonded” or glued to the shaft and cannot be adjusted like the original. If that sounds like a step backwards to you, given the adjustability popularity that has taken over the driver category this season and figures to continue through 2013, you may be half right. There’s nothing especially “new” here. So the question is why buy it? Just about every golfer desires more distance from his or her driver. It’s what the average player strives for and also the reason for the employment of certain R&D and marketing people at every major golf equipment manufacturer. The RBZ Bonded Driver provides the complete TaylorMade RBZ technology which makes the RocketBallz Driver among the best selling drivers ever, without an adjustable hosel. It has distance, but not adjustability. According to TaylorMade, the RBZ Bonded driver comes with TaylorMade’s “Inverted Cone” milled into the back of the face. This results in a large sweet spot while reducing the distance loss on drives struck outside the sweet spot. The Bonded Driver comes with the same ultralite TM 360 Lite grip, Matrix XCON 5 shaft and drag-defying aerodynamic head shape that produce faster swing speeds that leads to more distance. 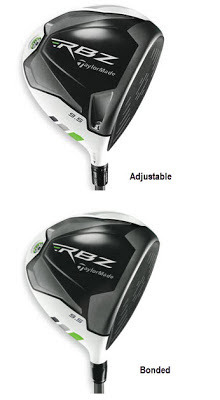 And the RBZ Bonded Driver has the same matte white crown and black face as the original RBZ Driver. For that reason, this is the same driver that created the huge hype early in the year minus one significant feature. That brings us around to the initial question: why would you purchase it? The lack of an adjustable hosel means one crucial thing: this driver costs less than any other high tech driver available on the market. You get speed, power and distance in a contemporary, Tour-validated look for under $199.00. In all honesty, I bet many golfers that buy an adjustable driver, set it once, and then never adjust it again. If you’re someone like that, then the TaylorMade RocketBallz Bonded Driver is for you and even better at a price that can't be beat!